Dusty Button teaching at IBW 2017. Photo by Chris Dowd. Dusty Button has always been known as the stereotype-breaking ballerina who plays by her own rules. After training at the Jacqueline Kennedy Onassis School at the American Ballet Theatre and London’s The Royal Ballet School, she joined the Boston Ballet corps in 2012, was promoted to soloist in 2013, and to principal in 2014. Throughout her career, she has also taught and trained aspiring ballerinas around the globe. Dubbed “a new brand of ballerina” by En Pointe Magazine, Button has blazed her own trail in the world of ballet. 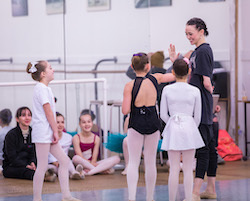 We recently caught up with Button as she prepares to return to Australia and New Zealand as the International Guest Teacher in International Ballet Workshops’ (IBW) summer 2019 series. After a successful tour with IBW in winter 2017, excitement is building to work with this inspirational teacher again. Here, Button tells us what drives her passion for teaching, how she never has a typical day and what she is looking forward to the most in her return to IBW. How did you enjoy your last tour with IBW? Part of ballet’s charm is its historic and classic appeal. 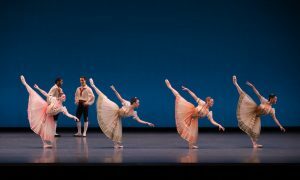 What do you think are the stark differences between the past and present ballet scene? What’s the best part about teaching young ballerinas? Was there a favourite teacher of yours that inspired you when you were a ballerina in training? Dusty teaching at IBW 2017. Photo by Chris Dowd. What is the most memorable performance that you’ve done in your career? What is your dream role, if you haven’t performed it yet? Dusty teaching at IBW 2017. Photo courtesy of IBW. What are you looking forward to the most coming back to teach at the IBW workshop? In your opinion, what is the most important thing aspiring ballerinas should know? 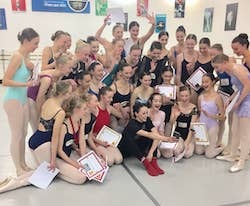 International Ballet Workshops’ Summer 2019 “Blaze Your Own Trail” Series with Dusty Button, and supporting teachers Brett Simon, Crystal Wong and Iona Marques, takes place on the following dates and venues: Melbourne on January 7 – 9 and 11 – 13 at Rain & Lucky Academy of Dance; Auckland, NZ, on January 15 – 16 and 17-18 at Wellesley Studios; Sydney on January 21-23 and 24 – 26 at The Conlan College; Hobart on January 28 – 29 at the Hobart Dance Academy; and Perth on January 31 – February 2 at The Perth School of Ballet. Some cities are already sold out, so register now at www.internationalballetworkshops.com. 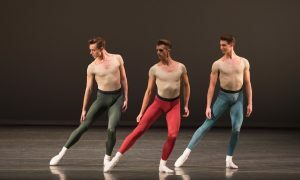 IBW is supported by Dance Informa, Capezio, EnPointeOrthotics and DanceSurance.